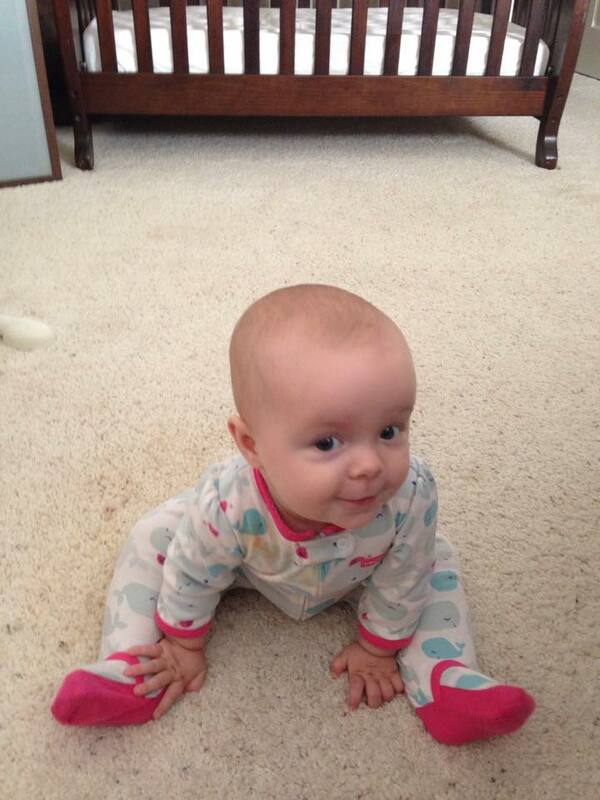 Psst… come closer and lend me your ears and I’ll tell you a tale of the baby who could sit up! 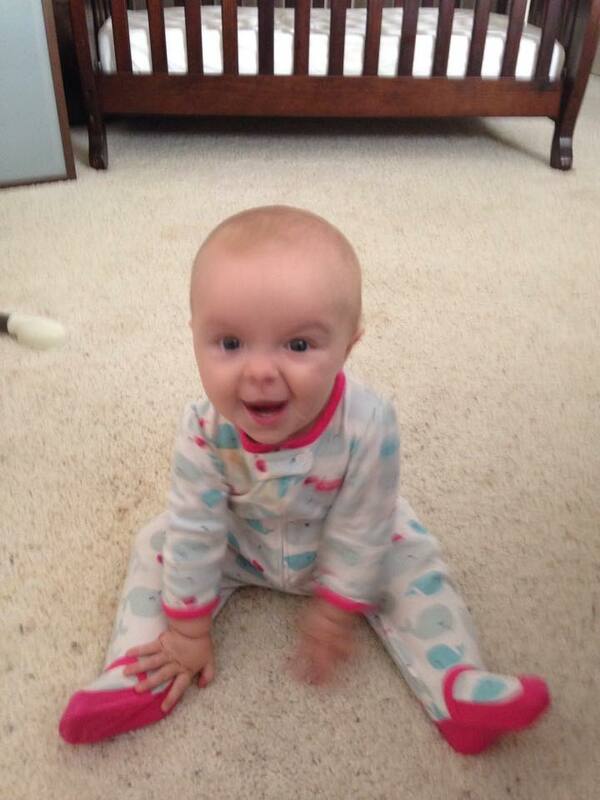 Bridget can now sit up all by herself and is really having fun with it. She lays on her back and pops up repeatedly like a little prairie dog. She must have killer abs. Part of the joy of having children is getting to see the world all over again with new eyes. Most things about the world aren’t fresh and interesting to adults anymore, because they’ve seen it and done it so much that they can live in autopilot mode for about 80% of their day (I completely made up that statistic, by the way). I’m guessing that’s why we do stuff like get off on the wrong freeway exit. We wear these little paths in our brains, flip the auto switch on, and zone right out. Generally it works, unless we are tired and accidentally turn onto the freeway exit next to our house when we meant to go somewhere else, or put our keys in the fridge when we pull the milk out then can’t find them for an hour. Or maybe that’s just me, because I’m the kind of fluffy dork who thinks about what my cat would tell me if he could talk instead of paying attention to what I’m doing. A couple weeks ago, for example, I accidentally poured chicken broth instead of almond milk into my cup of coffee. And it was the LAST cup of coffee in the house. That was an unpleasant surprise. I figured out what the cat wanted to tell me, though. He had been trying to order 200 gallons of milk off Amazon’s online grocery, but couldn’t pull my credit card out of my wallet because his claws kept getting in the way. Not really, but the amusing idea helped take the sting out of a giant mouthful of chicken coffee as my body seized into disgusted shivers. So gross. At least I can now play the Exhausted Parent card in moments like these. Baby Bridget, on the other hand, is not zoning out to all the daily minutiae of our everyday grind. She still finds everything incredibly new and exciting (plus, she gets a ridiculous amount of sleep. Jealous). Bridget has been trying to learn how to properly sit up for weeks now, ever since she got tired of diagonally rolling around like a misshapen onion whenever she wanted to get anywhere. I would watch her repeatedly flex her shoulders, try to reach her tiny arms forward, kick her little feet off the floor in a flailing attempt to gain momentum… then finally flop right back down and erupt into frustrated, defeated screaming. Poor thing. Finally, she did it. She was laying flat on her back and sat right up. She squealed in ecstasy, waves of pride radiating across her face. I grabbed my camera to capture her grand moment of victory. Even when babies are so young they are barely able to sit up, they seem to understand the function of a camera (Also the phone. It’s bizarre). Bridget caught sight of my camera and instantly started posing for it. Brimming with confidence, she laid down and sat up, again and again, showing off her newfound skill and flirting with the camera. Kids are so amazingly grateful for the little things adults have long taken for granted. But in this instance, I kind of understood how she was feeling. I remember exactly what it was like, back when I was about nine months pregnant, to get stuck on my back like some kind of enormous, flipped-over turtle. I’d flail my limbs around while trying to sit up, and finally roll onto my side, where I could bend my knees underneath my giant belly and use my arm and leg muscles to pull myself up. It was really frustrating. I totally get it, Bridget. Sitting up is awesome.